How much are your summer programs? Our workshops are P5, 000 per month, except for Big School Boost which is P6500 and Talas-Salitaan which is P3600. Assessment is for free and we offer an early bird discount for parents who would like to enroll before March 15 for our first summer run and before April 15 for our second summer run. When do your summer classes start? We will have two runs for our 2016 summer workshops. My child is doing okay in Reading and Filipino, do we really need to go for an assessment? 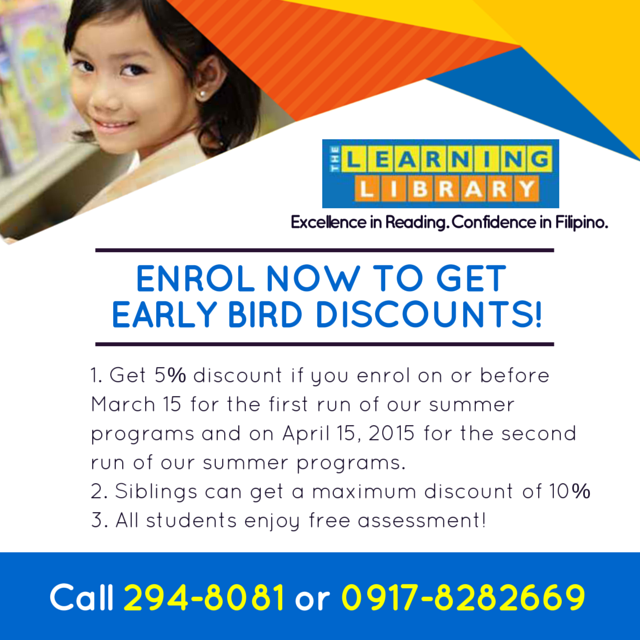 Yes because our assessments will help determine two things (1) the summer program that will best benefit your child and (2) the current level of your child in Reading or Filipino which is needed to prepare developmentally appropriate worksheets and activities for your kids. What discounts do you offer? We offer 2 types of discounts, (1) Early Bird Discount and (2) Sibling Discount. Both offer 5% off. Only one type of discount applies per child. How do I sign up for a summer class? You can pay the program fee in cash or cheque at The Learning Library branch you plan to have your child attend. You may also choose to deposit your payment to BDO checking account number 7640004605. (Please make cheques payable to The Learning Library Education Cooperative). 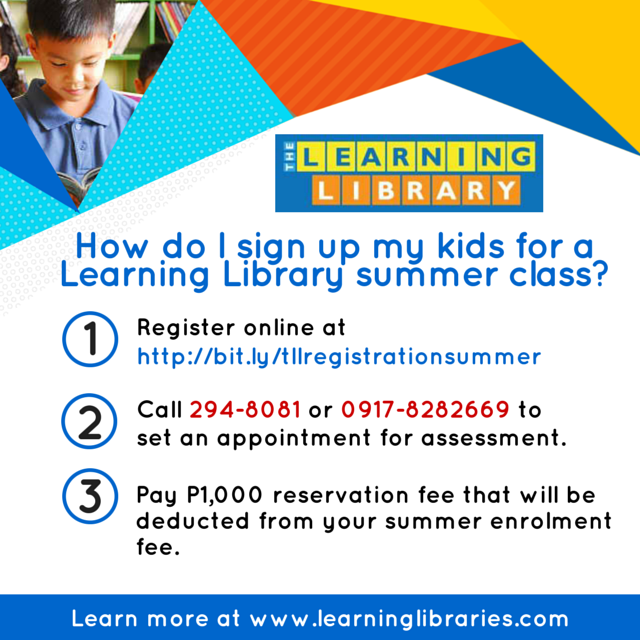 If you pay by deposit, kindly email your deposit slip to inquiry@learninglibraries.com along with you complete enrollment details (Name of Child, Age, Contact #, Branch, Program, Month) so that we can email you back a copy of your receipt. We look forward to a great summer with you and your kids!